When starting a new portrait, I generally look to those who are inspirational to me in some way as the subject. (I mean duh - who would want to spend hours painting someone who wasn't??) 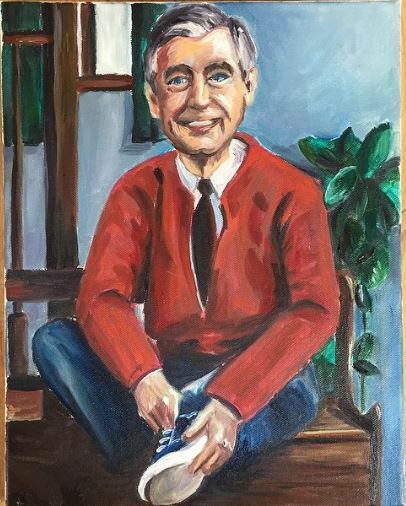 One of my favorite portraits of an inspirational person is of Mister Rogers. "You rarely have time for everything you want in this life, so you need to make choices. And hopefully your choices can come from a deep sense of who you are." Fred Rogers was, of course, the host, creator, composer etc for Mister Rogers Neighborhood for 33 years. But he was much more than that. He was trained in music composition, a trained pilot, an ordained Presbyterian minister, a puppeteer, author, educator and activist. He received over 40 honorary degrees during his life, never did a paid endorsement, was a lifelong vegetarian and still personally answered all pieces of fan mail. While all of those accomplishments are incredible - the thing that I love most about Mister Rogers is the message of worth and love that he made it his mission to portray through his show. He purposefully and intentionally created his show to help children deal with difficulties and learn to be comfortable as themselves. I remember watching as a child and feeling the comfort viscerally. Painting is oil on canvas, 12 x 16 and for sale :) Contact me if you are interested!